Cambodia’s capital city of Phnom Penh is a real city of contrasts. It is often said to be simultaneously fascinating and jaded, exciting and terrifying, inspiring and depressing. It is a city that is trying hard to move forward and overcome the horrors of its past, but it still bears many battle scars. Love it or hate it, Phnom Penh is a place filled with rich experiences to be had and it is somewhere that you probably won’t forget quickly. It attracts a large number of visitors and its close proximity to some of Cambodia’s saddest spots makes it a good base for exploring the notorious Killing Fields. There is accommodation to suit almost every budget and finding somewhere to eat and drink in the city is easy. Numerous taxis and tuk tuks ply the streets, so getting around is pretty easy too. There is a good selection of free things to do in Phnom Penh if you are trying to stick to a budget, so you can spend longer getting to know this city with many faces. Perched on top of a hill, the historic Wat Phnom is many years old. There is a small admission fee to actually go inside the temple, although you can stroll through the lovely grounds for free. From the outside, the temple is impressive. You can also see an interesting topiary of a clock that actually works, as well as several large statues and sculptures. A favourite is the enormous sea snake. There are some nice views to admire, and you will see elephants dutifully at work giving rides to tourist. The lively markets are free to explore and poke around, and they offer great opportunities for both window shopping and people watching. 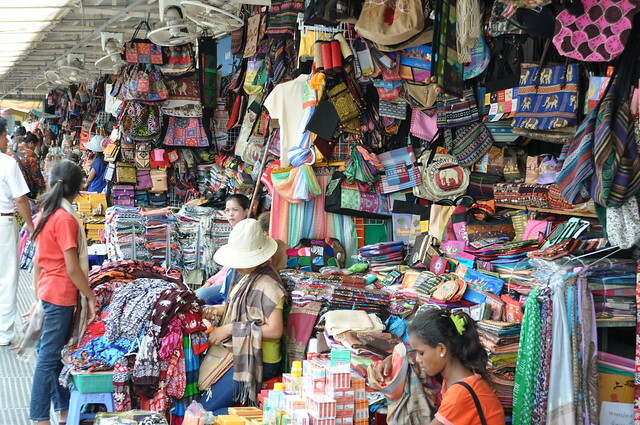 One of the best markets is the large Phsar Thom Thmei, where you can walk through the hustle and bustle and see a vast array of merchandise. As well as a wide selection of handicrafts, arts, clothing, accessories, and fresh produce, you will also see some of the famous fried bugs and insects. Prices are reasonable if anything does catch your eye. The weekend night market at Phsar Reatrey is a great spot to see local craftspeople displaying their products, and some may even by working as you pass by. If you take the time to simply wander around the city you will see a number of impressive buildings from the times of French colonialism. It costs absolutely nothing to admire these marvellous structures from the outside. Take a walk along the riverside to enjoy some nice views and soak up the atmosphere. There are many cafes, bars, and restaurants alongside that give lots more to look at. 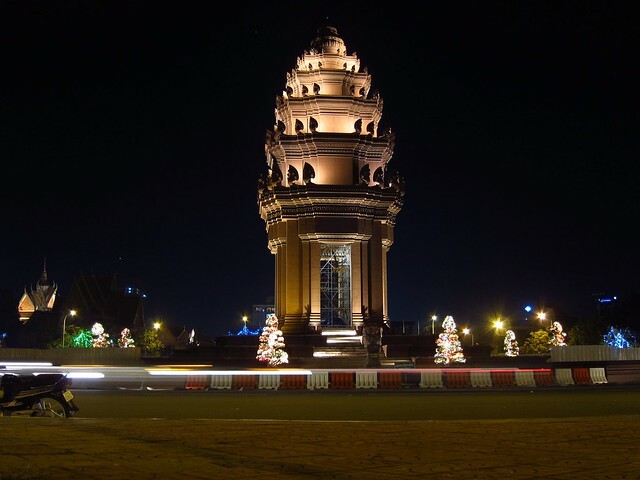 One of the city’s most important monuments, it shows the alliance and pledge of friendship and cooperation between Cambodia and Vietnam. It is a tall monument and at the bottom there are several stone soldiers. Another significant monument in Phnom Penh, the Independence Monument celebrates and remembers Cambodia gaining independence from France. It is a pretty monument, with a large spire and many intricate details. It is especially captivating at night when it is illuminated. 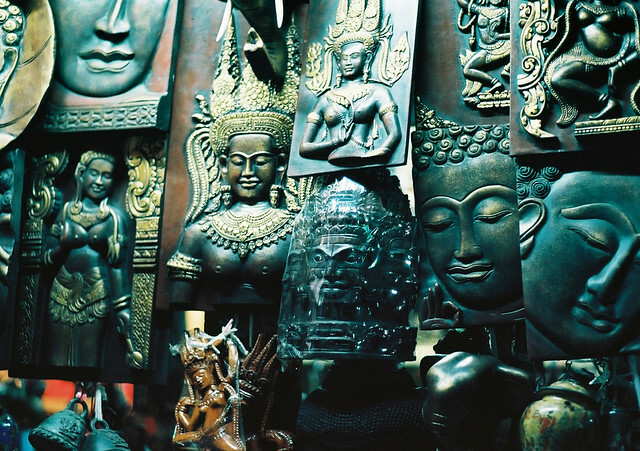 Mix and match the free things to do in Phnom Penh with the paid attractions to make the most of your time in the city.